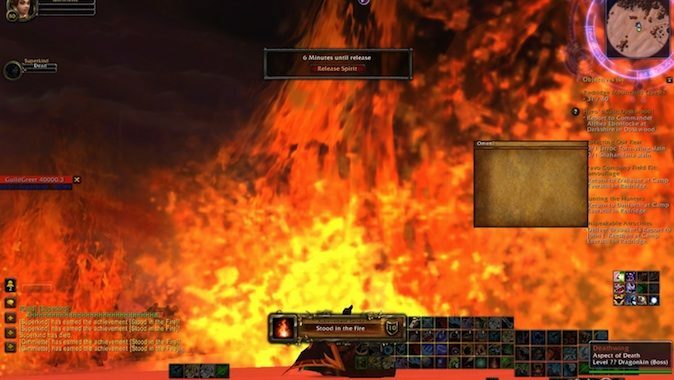 If you played during the pre-Cataclysm events and in Cataclysm up to the downing of Deathwing on your server, the above photo probably brings back memories — perhaps not entirely good ones. For those of you who did not play during this time, let me give you context for the photo. The guy who co-founded my guild and I went to Zul’Farrak for some reason which has been lost to the mists of time. On the PTR, we had learned Deathwing would be out in the world randomly showing up to burn sections of zones. If you were caught in the fire, you got the original Stood in the Fire achievement. Now, you can only get it by being flung off his back in the Spine encounter in Dragon Soul. I vaguely remember him showing up in every zone at the beginning. He was — gradually — pared back to just a few locations. My friend and I did what we needed to do in Zul’Farrak and headed back toward Gadgetzan. I’m following him. Why we were running back, I have no idea. We should have mounted and rode, but we were running. Suddenly, my screen got orange and red and a shadow appeared across it. I thought something was wrong with my computer. I had the sound on. I don’t know why because I tend to default to music, but that night I had the sound on. There was a roar and fire — all the fire. We were the first two people in the guild to be roasted by Deathwing — the co-founders. Seemed kind of fitting. Until he was defeated, he roamed Azeroth, frying sections of certain zones. I spent the summer of 2011 criss-crossing Kalimdor doing Archaeology for the Vial of the Sands. I seemed to get fried quite often doing Archaeology in Winterspring because I had to clear my dig sites in order to have new sites in Uldum appear. I think my roasting total was 7 by the time I got the Vial. I know people hated this. I liked it. As with the Fel Reaver in Hellfire Peninsula or the two giants in Howling Fjord or the whale sharks in Vash’jr, knowing there was something big and nasty roaming about made the everyday questing a little more exciting. Was today the day I’d be gathering debris in Hellfire on an alt and suddenly… that roar? Would I be digging by Lake Kel’theril and suddenly… that roar? I learned to be very aware of my surroundings — something which has helped in raids. How do you feel about gigantic monsters roaming about zones, either randomly appearing or just existing? Does that kind of encounter add to or detract from your questing experience? We don’t have these kinds of mobs anymore. If you could add one back into a zone, what would it be and where would you put it? Finally, if you played during Cataclysm, where did you get roasted and how many times did he get you?